Uglyworld #744 - I Trained Him (238-365), originally uploaded by www.bazpics.com. After the revelations that Babo shared with me back in July about him being a secret agent back on Uglyworld I've been waiting for him to share some more of his background with me and in turn with all of you. Last weekend I had finished yet another book (this time it was the action thriller "Adrenaline" by Jeff Abbott) so I had been thinking of what book I could pick up to read next. While wandering around the local Target store Babo found and delivered me the next book I would read. I've previously read all of Robert Ludlum's original novels including the stories of Jason Bourne and his quest to find out who he really is, and since the untimely demise of Mr Ludlum I was pleased to see the novellist Eric Van Lustbader step in and continue the Bourne story. 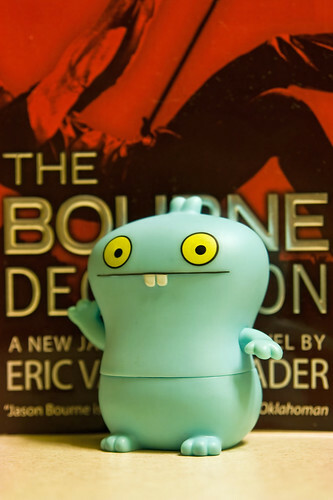 Babo had managed to find the latest novel in the series entitled "The Bourne Deception", and based on the fact that he wasn't even around when I read the original novels it intrigued me as to why he chose this particular book. Tonight he saw me checking out the pre-face in the book and once again went through his sneaky routine of running to the door, opening it, checking outside in all directions, closing the door, turning the lights off and then monitoring for movement outside through the curtains. Once he was satisfied that it was safe to continue he began, "You remembers I telled you of my job where I aborts the cookies mission? ", I nodded in agreement and he continued, "Well, you see's, this books here is not justs a story, it be's real lifes too, as Jason Bourne came to Uglyworld for trainings." He stopped talking and moved to the door almost as though he suspected something or someone was outside, but after a few minutes he came back to the couch and informed us "Is ok, was onlys an owl about 4 blocks away, playing in the nights air". "Jason was put into my charge, so I had to teaches him all kinds of specials stuff that he may needs in certain situations, like how's to disarms someone or gets information from bad peoples". Everyone listened intently on the edge of their seats to Babo's story which had us all captivated. Cinko asked if Babo could show everyone some of his "specials agents" skills sometime, as the fact that Babo could teach how to disarm people sounded too good to be true. Babo is currently trying to arrange a special "closed doors' class for the guys sometime soon, they can't wait for this to happen and to hear more of Babo's tales of his mysterious past back on Uglyworld.